Manual that serves as the basis for the decisions made by the St. Helen's School Teachers, Principal and Parish Education Committee. 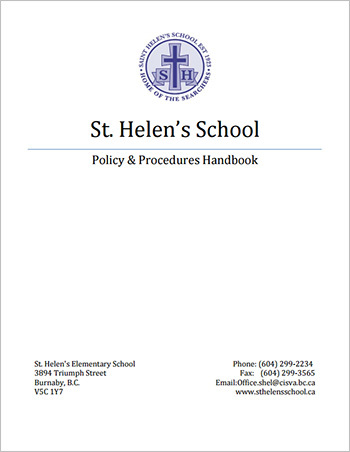 The policies in the St. Helen's Policy and Procedures Handbook exist as the basis for the decisions made by the Teachers, Principal and Parish Education Committee of St. Helen's School. The manual is consistent with the policies outlined in the Catholic Independent Schools of Vancouver Archdiocese Policy Manual which is available on the CISVA website at cisva.rcav.org. St. Helen's School Policy and Procedure Manual is posted on the school website at sthelensschool.ca for all of our families. The manual is updated as required. A draft of the proposed policy, either written by a member of the Educational Committee or the Staff, must be presented to the Policy Handbook Committee, a sub-committee of the Education Committee, for discussion, editing and evaluation. The finished draft approved by the Policy Handbook Committee must be presented to the entire Education Committee, including the Pastor, for evaluation and approval. The acceptance of a new policy requires a 50% plus one vote by the members of the Education Committee. To change an existing policy requires a 75% vote by the members of the Education Committee.